There may be many of your friends in your Facebook account whom you want to simply avoid chatting with. But because of the read receipt feature of Facebook chats which send an acknowledgement to the sender of the chat message, you are unable to avoid any of your friends without being noticed. Thanks to the browser extension which solves the problem. Just install this and you will be unnoticed by the person who wants to chat with you although you have seen their chat messages. As shown in below the image, for every message sent by the sender and seen by the recipient will send read receipt for the same to sender. However, after installing the Chat Undetected extension, the sender will no longer be able to receive read receipt status for the message sent to the recipient though the recipient has seen their messages. Go to their website and click on green button named ‘Get Chat Undetected’. It will then figure out which web browser you’re using. Depending upon your browser, it may prompt to download and install the application on your system or will prompt to install the browser Add-On. Note: For Chrome and Internet Explorer, you may need to download and install chat-undetected.exe. For Firefox, you will be prompted to install browser Add-on . 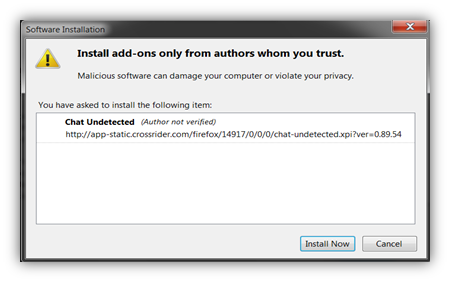 For Chrome & IE: If you’re using the web browser Google Chrome, It will prompt to download chat-undetected.exe. Once it’s downloaded to system, install the application on your system and you finish your task. For Firefox: If you’re using the web browser Mozilla Firefox, you will see the below window asking you if you want to install the add-on. Click on Install Now to finish the installation process. Congratulations, you’re a Magician, you have successfully made the ‘Seen’ status disappear and the friends you are chatting with won’t able to tell if you have seen their chats.